Recently we received an email from Justin Marshall, and inside it contained a whole lot of pictures of his customs. There were a whole lot of good ones, but the one I wanted to talk about today was the Haunted Mansion. I really like the look of this figure. He does a great job of getting a lot of details with his paints. The hitchhikers on the front, and the shadow on the back. I also enjoy the wallpaper eyes all over the front. This makes me look forward to the official Haunted Mansion set coming out this fall! I got a chance to ask Justin more about this figure. 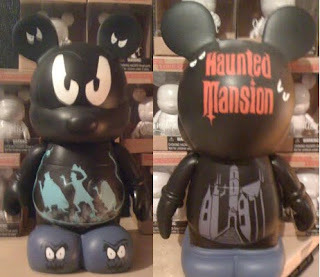 MC: How long have you been creating custom Vinylmation? Justin Marshall: I have been creating them since July 2010. MC: In that time how many pieces have you created? MC: What piece that you have created is your favorite? 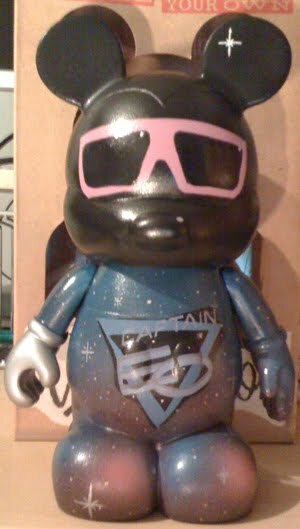 JM: I think my first creation that started it all, Captian EO. 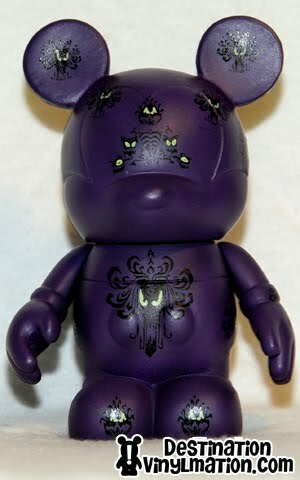 MC: Do you collect the Vinylmation created by Disney artists? JM: Of course, I love them! MC: What is your favorite official Vinylmation figure? JM: That’s hard, Haunted Mansion Wallpaper, but also love Mr. Toad! MC: Well that makes sense, especially since you made your own version. How did you come up with the idea of a Haunted Mansion piece? JM: The original poster you see at the entrance of the magic kingdom (under the railroad track). MC: Can you describe this figure? The inspiration. What detail went into it? JM: I love the original conepts when WED was creating this attraction. The park has so many characters, but when it comes to the Haunted Mansion, in the early years, there weren’t any characters, just a large creepy structure. So the hitchhikers have grown to be the memorable characters ove the years and people love at the end of the ride when one of the 3 hitchikers jumps into your doombuggie following you home. So gathering what a vast population of Disney visitors know was the key. They can relate to it. MC: What is your favorite aspect of it? JM: Painting those odd shaped hitchhikers on the front. One’s tall and skinny, one’s heavy and wide, and then you have the little guy that’s holding the ball that probably weighs more than him! I picked a pale blue just like you see when you’re in the graveyard. I wanted the precise color. MC: I think you did a great job on them. What was the hardest part in creating this figure? JM: Trying to duplicate the wallpaper! I was going to do a wallpaper head, but if you really look deep into the design, it’s complicated, especially when painting on a rounded surface. I ended up with just the eyes, but have plans in the future to conquer the wallpaper design! MC: So when you’re finished with that wallpaper one, or if anyone wants to see your other work; where can people go to find out more about your pieces and see your work? JM: I am working on a dedicated page solely for my vinylmation creations. But I am on Facebook, just look up my email, [email protected], or people can email me a request for something they would want to see put on a vinylmation. MC: Thanks for dropping by! Again, love this figure.